Please note this giveaway has now ended. It’s a special day today, not only am I here joining Kim from Cravings of a Lunatic in memory of her dad but it’s father’s day! So today, I’m going to share a special and funny story between my dad and I and then give you my version of Friendly’s Peanut Butter Cup Sundae which we’d used to get after our “date nights” out. Kim’s story about her dad really touched me, as my family all went through the emotions with my dad a few years ago. I love my dad like you wouldn’t believe, sure I gave him daughter grief but I wouldn’t have been a good one if I didn’t. 🙂 So when my mom told me he had prostrate cancer I was freaked out. No way, not my dad, but you see my mom is good. She’s a nurse, so she’s on top of our health and they caught it early and he’s cancer-free now. Dad and I spent a lot of one on one time growing up. He’d would drive me 45 minutes each way to pre-college music theory class and sit and wait while I had class (did I say wait, I mean sleep in the car!) On weekends when Mom had to work evenings, I didn’t want to leave Dad home alone so we’d go to the movies and for ice cream. We’d always see the ones Mom didn’t want to anyway but to save a few bucks I’d run into the bathroom while Dad bought two senior tickets! They never caught our act and we still laugh about it to this day. My very favorite thing about going out though was our post-movie ice cream sundae’s at Friendly’s. I didn’t need to look at the menu, there was only one sundae I ordered anytime we went, their peanut butter cup. Since neither of us live near a Friendly’s any more, I’ve made my own version! In the past you could choose any ice cream flavor, but to enhance the experience I’ve made a peanut butter cup ice cream to go along with the peanut butter sauce and hot fudge. I like to use freshly ground peanut butter, because of this my ice cream custard ended up extremely thick and my sauce more chunky style than smooth. Feel free to use any type of peanut butter that you like, but I do recommend a version without added sugar. In a medium saucepan over medium heat, mix together the peanut butter, brown sugar, salt, vanilla bean, milk and heavy cream until dissolved and it just begins to simmer. In a small bowl, whisk the egg yolks and slowly drizzle in 1/4 cup of the hot liquid to temper the yolks. While whisking, drizzle the tempered yolks into the custard. Continue to whisk, scraping the bottom until the custard has thickened. You can check by dipping a wooden spoon and running your finger across the back. If the line stays you are good to go. Strain the custard into a large bowl and chill completely before churning in your ice cream maker. Once the ice cream is done churning, mix in the chopped peanut butter cups and transfer to an airtight container to freeze fully. In a small saucepan, mix together the chocolate, cocoa powder, butter, heavy cream, sugar, corn syrup and salt. Stir until completely melted and thickened over medium-low heat. In a small saucepan, mix together the peanut butter, heavy cream, sugar and corn syrup. Mix well and stir until completed melted over medium-low heat. In a sundae bowl, drizzle some of the peanut butter sauce and hot fudge, place a few scoops of ice cream and top with more of the sauces. 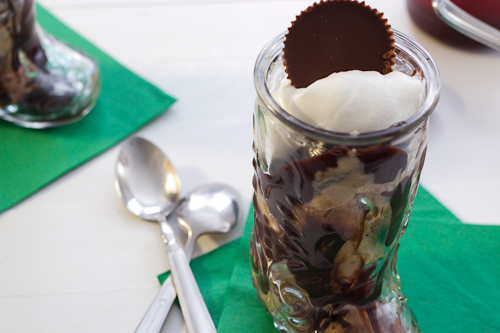 Finish with whipped cream and a peanut butter cup. You d run into the bathroom and he would get 2 senior movie tickets? lol That’s a memory to treasure. Glad to hear that your father is all fine and that the cancer was treated early enough. IT gives one hope to know that others have survived the illness. I want your peanutbutter ice cream sundae!! what a beautiful story and memories with your dad. 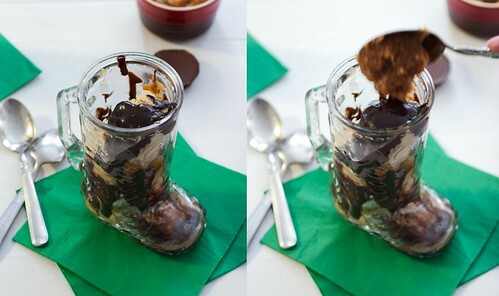 These sundaes look amazing. I’m so glad that your dad is cancer free-that’s awesome! I’m so glad your dad is free of cancer…and that you two have such a wonderful relationship. 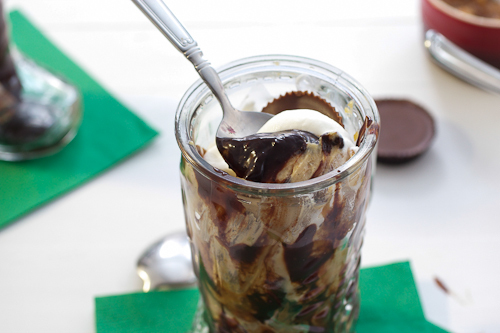 Your pb cup sundae would be a huge hit at my house…I need to put pb ice cream on my “to-try” list for this summer. PERFECT with hot fudge! Beautiful memories of you and your dad! 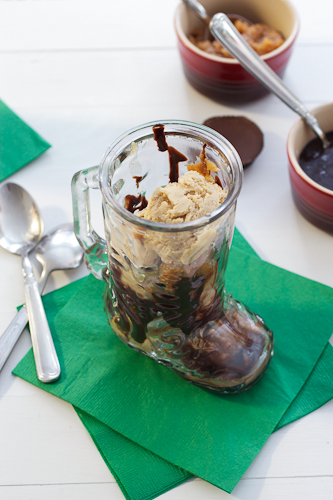 This sundae looks ridiculously good and I love the little glass boot you served it in. So glad your father is cancer-free now, Susan. Love the Friendlys and movie stories. My mom and I used to visit Friendlys also when I was an apprentice at the Hampton Playhouse for 2 summers .. My favorite was chocolate chip. But have clipped your PB ice cream and look forward to relishing the good memories and tastes. I really love this story about your dad. I totally laughed out loud. I can just imagine you hiding out in the bathroom waiting for the all clear! THe sundae sounds delicious too! Yum! I’m so glad to hear your dad is cancer free, Susan. Thank goodness! And thank goodness for your mom who made sure that her family got regular check ups! I loved the story about your dad buying 2 seniors tickets. Way to go! I’m all about going to crazy lengths to save a buck. Your dad sounds like a wonderful man and I’m glad that you can still enjoy this amazing sundae with him. Girl, you did good – this looks incredible! There’s something wrong with my eyes (and my brain) though. I didn’t know that was a boot cup until another commenter pointed it out! Too cute. Cute memory with your Dad! I love that. I would have always ordered the peanut butter cup sundae too. Susan thank you so much for joining us for this very special cause. I am so happy to hear that your dad is doing well and cancer free. Thanks for sharing your story with us. I love that you have a place and a dessert that is just for you guys. That’s so wicked cool. It looks like I’d need a spoon in each hand for this one. If I won the Mixer, I would make my birthday cake with yummy buttercream icing!! If I won the mixer, I’d make matcha ice cream for sure! LOVE the story about your dad, and this recipe! Thank you so much for joining us for this post!